The entrance opens into a large living area with a bar and a large fridge on the left. On the right is a large kitchen area with separate scullery, a pantry and an ice-making machine outside. The kitchen is very well-equipped with two fridges and there is a deep freeze in the pantry. There is a lounge, fireplace, TV and an inside eating area inside opening through glass doors onto a walkway which overlooks the bush in front of the Lodge. The lounge area opens to the left onto a covered stoep with a gas braai and another dining area. To the left of that is a boma and outside braai area with a plunge pool above it which has an uninterrupted view of the waterhole in front of the Lodge. You go down to three of the five en-suite ‘chalets’ on the left each of which is very well furnished with a bath, inside and outside shower and toilet – they sleep two. The other two chalets are to the right of the Lodge entrance and have similar accommodation. There is a study off the lounge to the right with stairs leading up to another lounge with TV suitable for teenagers and children. 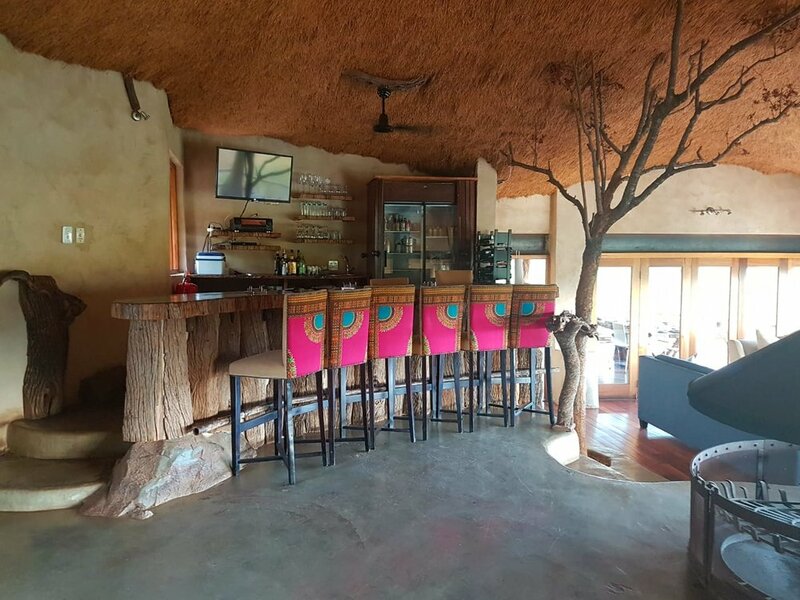 This opens onto a small balcony with great views of the bush where animals can frequently be seen going to and from the waterhole. The Lodge sleeps ten (as do all the other private lodges in Madikwe) which the maximum number allowed on the vehicle. Besides the ranger and his partner, there are two other permanent lay staff and a handyman.